It was an ingenious idea of unprecedented efficiency– an entire jail, full of prisoners, all controlled by just one jailer. Instead of going to the cells the jailer brought the prisoners to him, simply by turning a crank.It was also escape proof. Until a specific pie-shaped cell of the inner rotating cage was aligned to the lone opening in the outer cage there was no way out. Though the idea was captivating in theory, the reality of turning a 90,000 pound cage with a hand crank was difficult to reliably achieve with the technology of 1885. 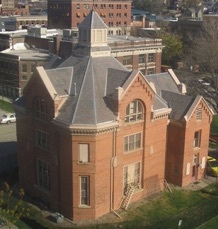 Only eighteen were ever built, the jail in Council Bluffs the largest and the only one with a three story cage. 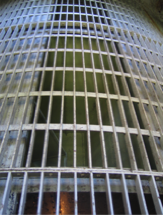 Even beyond the scarcity of the rotary jails in general perhaps the most significant feature of the Pottawattamie County “Squirrel Cage” jail is that it lasted so long. Though initially praised as innovative, public option rapidly shifted to feelings that the jails were cruel and inhumane. The oft jammed mechanism could isolate a prisoner for days with no food, water or medical attention. Arms, legs, or even heads could be crushed if caught unawares between the turning bars. Providing heat and lighting to a cell that rotated wasn’t even realistic. Most rotary jails were condemned within a few years, but not the one in Council Bluffs. It served as the Pottawattamie County jail for nearly seventy years. The building survives today as a museum of the Historical Society of Pottawattamie County. Is the "Squirrel Cage" jail merely creepy... or is there something more going on? 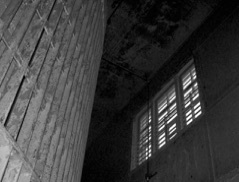 Click here to learn more about paranormal investigations of the jail! Open November through March Saturday 11am-4pm and Sunday 1pm-4pm. Please arrive a half hour before closing to make sure you have ample time to enjoy the exhibits. Please contact us in advance to arrange group tours. So why did Council Bluffs have a roatary cell jail? The events that led to it probably started with a steamboat that became stuck on a sandbar in the Missouri River in August, 1859. Learn more at our upcoming program, Council Bluffs: Where the East Ended. Hear how a chance encounter between an aspiring politician and a young railroad surveyor changed the future of Council Bluffs, the Midwest, the nation and quite possibly the world as local history enthusiast Danette Hein-Snider and Dr. Richard Warner from the Historical and Preservation Society present Council Bluffs: Where the East Ended-- and Why. The program will be Wednesday, April 24, 6 pm at the Council Bluffs library. There is no admission charge and the public is invited.